Today was, by far, the day with the most mosquitoes. They were horrible! I spent almost the whole day with my mosquito net on and they still somehow flew in there! 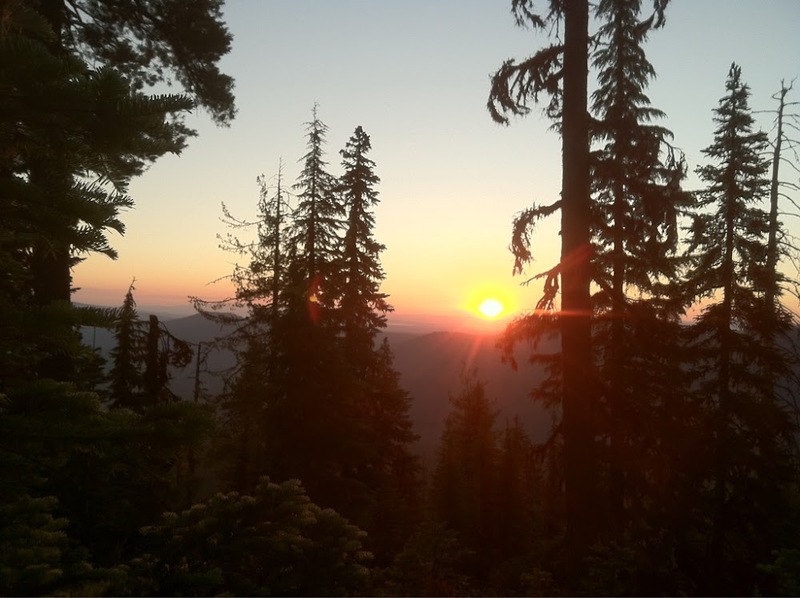 We got going early at 6am again and had another nice sunrise through the trees. It was quite cool out, so we were protected for the first half of the day with our long sleeves and pants. A couple hours into hiking, we came to Windigo Pass and there was trail magic! 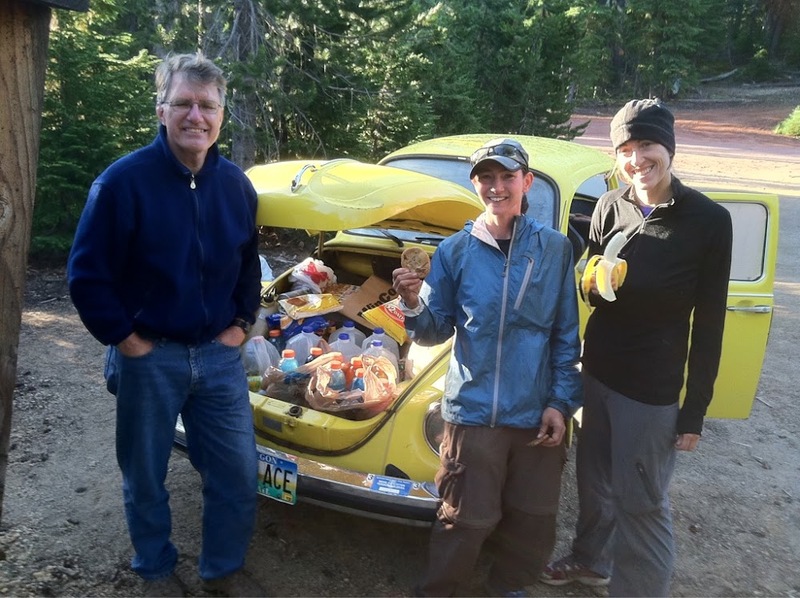 A two time thru hiker named Jerry was there providing tons of food and drinks out of his car. When we arrived two other hikers were there, Cow Pie and Chris. They had made it there last night before the the rain and had a great time. It was still early for me and Jennifer so we had bananas and cookies. Jerry also follows my journal and many others, so I want to send him a big THANK YOU! That was a great surprise a I was happy that Jennifer got to experience her first trail magic. We continued on with the goal of making it to Summit Lake for lunch and possibly a swim. Along the way, we took a break on a ridge with a great view. We weren’t sure, but we saw mountains in the distance that resembled the Three Sisters and Bachelor and that was exciting to think that I will be there in a matter of days. 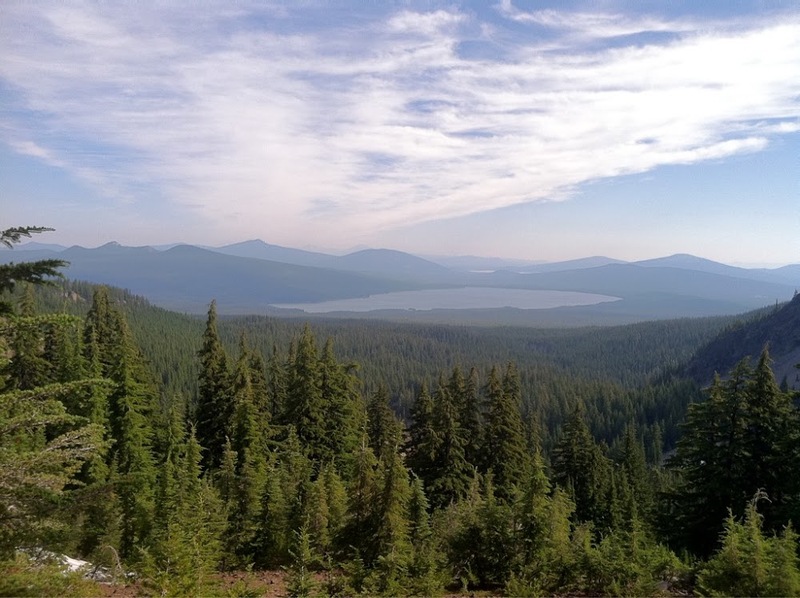 I was surprised that no one caught up to us today, especially the crew I had been hiking with before Crater Lake. I got a text from Liz that she, Funyan, and Meow Meow were taking the old PCT alternate route to Shelter Cove. It has more water sources, is at lower elevation, and cuts 10mi off the distance to Shelter Cove. They had spontaneously decided to summit Thielsen the other day, so they figured it evens out in the end. The trail angel, Jerry mentioned it this morning and Cow Pie took that route too. I’m assuming that’s also where Half Fast and Red Blaze went. I’m just too much of a purest to take that alternate and I actually liked the trail and views we had today. Liz still has my socks and we will see all of them tomorrow when we get to Shelter Cove. We ended up making it to Summit Lake after lunch and it was mosquito heaven there! They were all over us and we even had on our rain jackets and pants. It was early afternoon and we were getting pretty hot. Neither one of us likes cold water, but the lake wasn’t bad, so I had my first “swim” in a lake of this hike. We both were too chicken to get in past our stomachs, but it felt great on our legs. The best part was that there weren’t any mosquitoes in the water. We were very proud of ourselves and considered it our warm up to possibly getting all the way in the lake tomorrow at Shelter Cove. 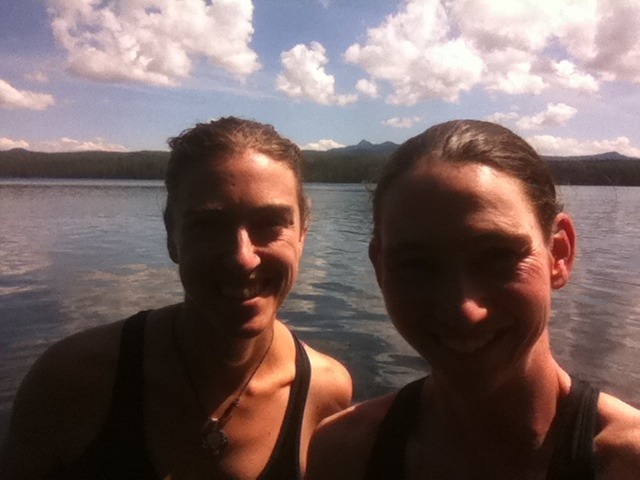 After our “swim,” we lathered up with deet and headed for a 5mi gradual climb that skirted Diamond Peak. When we got up there, it looked like the Sierra! 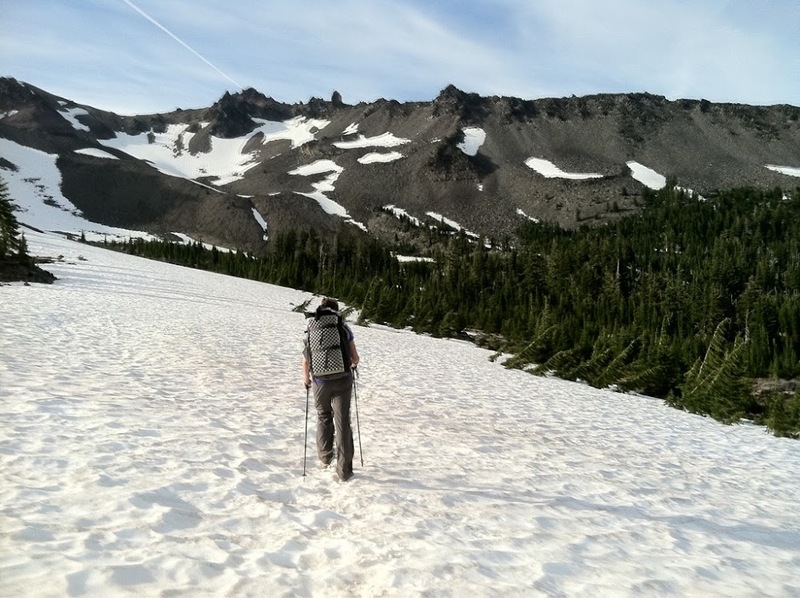 Peaks with snow, rocks, and even plenty of snowmelt water for us to cross. Had I known I wouldn’t have carried the 4L of water we thought we’d need to dry camp uphill for 5mi. Oh well! Once we got up there, we were both surprised by the terrain. It made finding a camp spot more difficult because it was not level and there were many rocks. After a little searching off trail, we found a good spot that is a bit lower and hopefully less exposed if wind or rain comes. 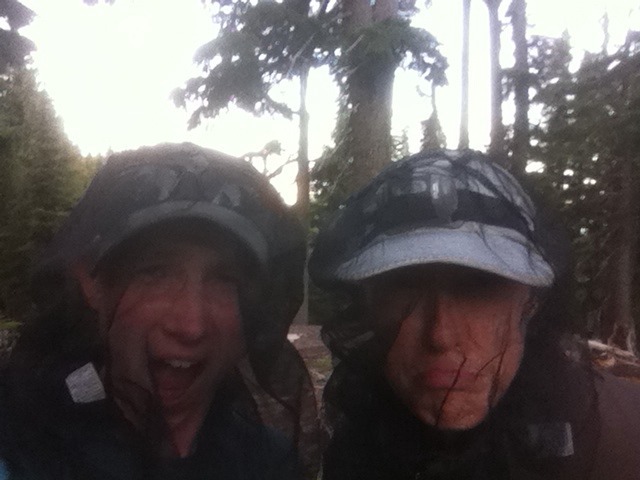 Unfortunately, there were tons of mosquitoes. It was crazy! We had to eat dinner in our tents and each time we opened our tent doors, a swarm came in and we had to spend time killing all of them. We are hoping they aren’t as bad in the morning. As I type this, the temperature has dropped quite a bit and the wind has picked up. We are hoping it doesn’t get worse or keep us up all night.